Greg grew up in the footsteps of his grandfather, Emery Rowland. Emery, an experienced farmer and agriculturalists, taught Greg the necessary skills that it takes to produce an extraordinary crop and how to care for the land. While most of Greg’s youth was spent on Emery’s farm near Claypool Indiana, Greg graduated from Concord High School in Elkhart, Indiana. 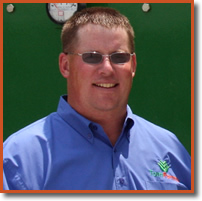 Greg oversees a large share of the farms day to day operations, helping to keep the team organized and flowing efficiently. He had previously been positioned as the day to day operations manager of the grain facility, managing over two millions bushels of grain. He has since handed that off and is involved with large scale organization of grain, logistics, and farm operations including commercial corn, seed corn and soybeans. Greg is married to Kassi Rowland, an active member here at Tom Farms and they have two girls who they are raising with the same life lessons and values as what Greg’s grandfather Emery had taught him. While Greg is not at work, he is actively involved with his church’s Staff Parish and 4-H Beef Committee. He also enjoys his time spent mowing and manicuring his immaculately groomed yard.